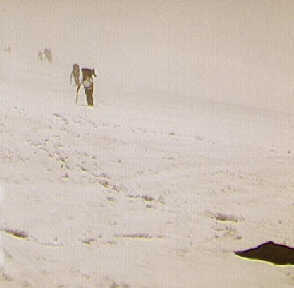 On Memorial Day Weekend in 1997 I traveled to Seattle to climb Mount Rainier with an old friend of one of my climbing partners. 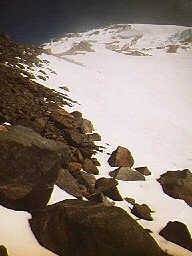 I have wanted to climb Rainier since I saw it in the 50 Classic Climbs of North America. Brad organized this trip and over a period of time the crowd of climbers grew to 10. It gave me a chance to see and hear what Pacific Northwest climbing was all about. Here are some pictures: I am still working on the story that goes with them. I would like to thank Brad and his wife Leesa for their hospitality and instruction on glacier travel. Here we are at the base of the mountain. It was snowing before we hit the trail. It was snow hiking right from the parking lot. Brad (lifting up the pack) made sure we had what we needed. 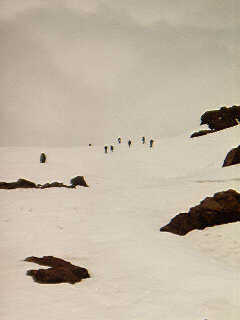 This was our first glacier crossing. We roped up and then climbed the ramp up and right. We were enveloped in a cloud as we climbed to the ridge. It was eerie climbing up in a whiteout close to the edge of the cliff. John, Craig and I forged ahead and cut steps for the rest of the group. This was Camp One were we spent the first night. We spend time digging platforms for our tents. We had a great setup with our Megamid tent. No tent flapping on this night. You can see us loading up here for the hike to come. As we headed up the mountain we spread out and hiked at our own pace. I reached an area called the Turtle (I think) and looked back to take this picture. The clouds swirling in the background were cool. After the long slog up the snow slopes this rest stop was welcome. Power Bars and nuts were the order of the day. Gu and Gummy Bears were a big hit too. It was a sustained hike up to Camp Hazzard where we spent the second night. We were glad to get there. Setting up camp was quite a chore digging out platforms for the tents. This is the view from my tent. The Ice Cliffs were incredible. Our route in the early morning hours would traverse below the cliffs. We sat up above the gullies that carry the ice falls and watched the path of the debris. We picked out a line for the 1:30 AM curtain call. John hanging out at Camp Hazzard. On summit day (well almost) we got up at 1:30. Really I never really got to sleep. 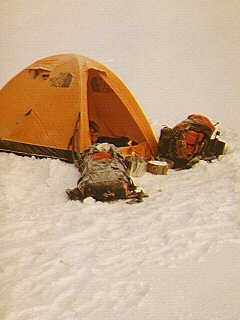 The tent was flapping with the sound of a freight train. 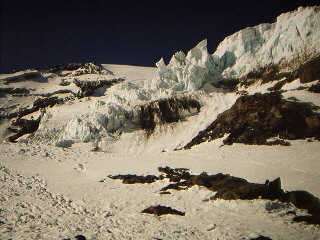 Then at 12:15 AM the Ice Cliff cut loose a huge chunk My heart pounded waiting for the impact but it never came. How unnerving. We started climbing with headlamps by 3:00 under a full moon and clear skies. We all cast short shadows on the steep slopes. Crampon traction was awesome and we moved fast. This climbing was great. 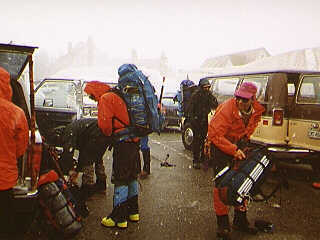 Here we stopped to put headlamps away just as the mountain was shrouded in clouds. The weather only got worse as the day progressed. 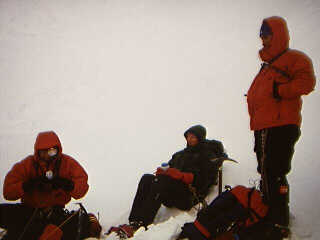 At 13,600 feet in 40 mile winds and 12 degree temperatures we decided we all had enough. After the summit attempt was abandoned we made our way back to the base of the gully. The descent to this point was steep. 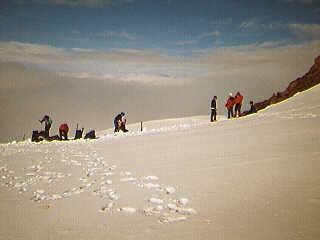 We placed pickets and belayed one another down the steep slopes in the blowing snow. I found this to be a great experience being able to climb comfortably in these conditions. I had great confidence in the terrain and with my rope team. 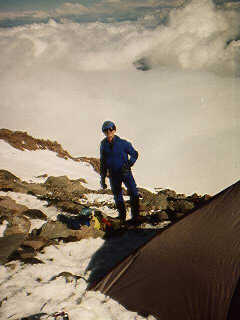 After a final lung-busting sprint up the bowling alley gully we were back a camp. We packed up and headed down to the cars. Snow turned to rain and it was a long and wet day. When we got back to the cars all I could think of was dry clothes and a place to sit down. As we approached the truck we found it was tampered with. Most of our extra gear, clothes, money, ect were ripped off. What a bummer. I managed to find some clothes in my suitcase the thieves decided not to take. I was one of the lucky ones. 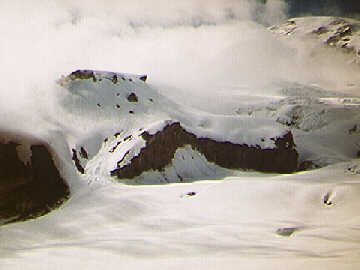 Even with this bad spin, I had a great time on Rainier and look forward to climbing on it again some time soon.